Not quite sure how I found it, may have been through a client media search but somehow I stumbled across a groovy site called Prediction Pad. Basically you can browse on over and wax lyrical about your thoughts for the future. As you can see, mine are not all that interesting but when you actually sit down and think about future trends it is difficult trying to things that are not just plain odd. 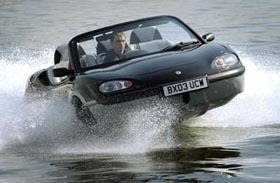 A car that is a boat Ã¢â‚¬â€œ the future! Anyway, a few moments after posting I got a response from the site owner which is a nice touch. I recommend people go and have a bash.